In the far future, mankind has scattered to many worlds and divided into many races . . . and some are very alien, despite their Human ancestry. 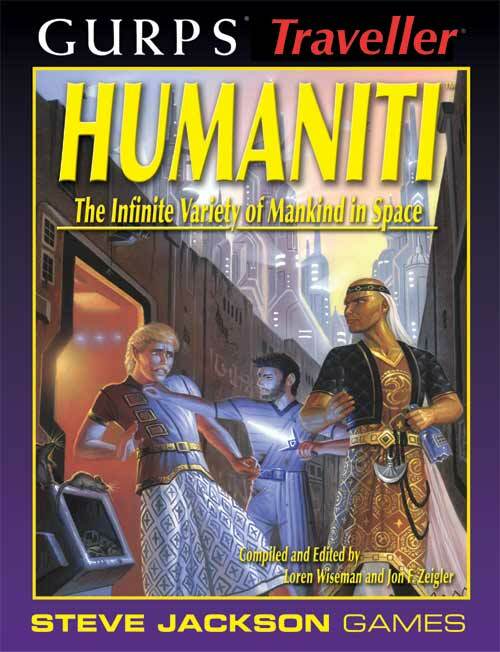 GURPS Traveller: Humaniti describes 16 Human-descended races from the far reaches of the Imperium and beyond, including the technologically advanced Darrians (with their sun-smashing Star Trigger), the carnivorous Dynchia, the dour warrior Azhanti, and the aggressive Itharans. Compiled by Loren Wiseman, this book is a valuable resource for any Traveller campaign. 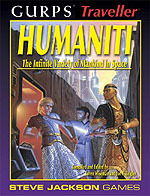 Never-before-published details on the societies and cultures of 16 races of Humaniti. Maps of the Answerin, Darrians, Irhadre, Kargol, Luriani, Nexxies, and Otrai homeworlds. Background histories and character-creation details for all 16 races. GURPS Traveller: Nobles – Details the lifestyle, fortunes, duties, and responsibilities of the nobility in the Third Imperium, the Vilani ruling class at the height of the Ziru Sirka, and the Darrian and Zhodani systems.